Spinx is a pretty black and white cat of 6 years old. 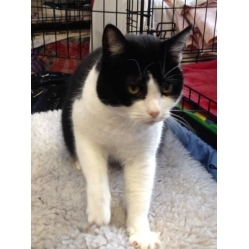 She is extremely loving and is longer for a new home to call her home. Spinx can live with children of 10 years or order and is looking for a home away from busy road. Please call Pat on 01494 722279 if you are interested in homing Spinx, you are always welcome to visit. All our cat and kittens are vet checked. Also vaccinated, treated against fleas and worms, and older cats neutered.